Save on your next flight from FRW to ABQ when you book through Travelocity. Need a last-minute flight to Albuquerque? Travelocity offers discount airfare no matter when you book, even on popular routes such as Francistown Airport to Albuquerque Intl. Sunport Airport. Whether you need a direct or indirect flight, you can trust Travelocity to provide you with the best prices for FRW to ABQ flights. Explore Albuquerque with Travelocity's Travel Guides to find the best flights, cars, vacation packages and more! Hyatt Place Albuquerque Airport is a 2-minute drive from the terminals and 10 minutes from the historic city center. Within 25 minutes, guests can be driving on Route 66, America's most famous old highway. The Nob Hill shopping district and Rio Grande Nature Center are both even closer to the hotel. 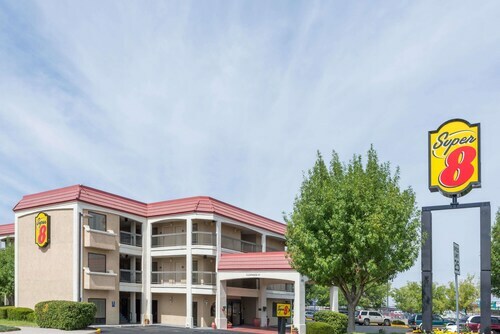 Situated near the airport, this hotel is 1.1 mi (1.8 km) from Isotopes Park and within 3 mi (5 km) of University of New Mexico and Albuquerque Convention Center. University Stadium and Puerto Del Sol Golf Course are also within 2 mi (3 km). Situated near the airport, this hotel is 0.6 mi (1 km) from Puerto Del Sol Golf Course and 1.6 mi (2.6 km) from University of New Mexico. Isotopes Park and University Stadium are also within 2 mi (3 km). Situated near the airport, this hotel is 0.7 mi (1.1 km) from Puerto Del Sol Golf Course and 1.6 mi (2.6 km) from University of New Mexico. Isotopes Park and University Stadium are also within 2 mi (3 km).